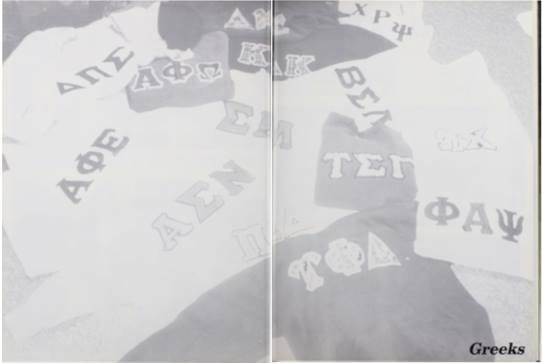 Reading Between the Letters is an Ursinus digital history project that records the inclusion of marginalized groups within Greek Life from the 1970s to present day. During this time frame, values of diversity and inclusion began to gain momentum on a national scale with the civil rights and feminist movements. Our research seeks to understand how Ursinus was affected by and responded to the national discourse on diversity and Greek life. Our research question is: How inclusive has Greek life on campus been of marginalized groups, including women, people of color, and the LGBTQ+ community? Our primary sources include Ursinus' newspaper articles, especially opinions and editorial pieces, to understand overall inter-fraternity and sorority policies and broader student body responses. We also use photos from the yearbooks of Greek organizations to complement our findings from the newspapers. Our exhibit presents and compares articles about greeks, faculty, and the student body as a whole to gage the way racial and gender inclusivity has played a role in Greek life. The History of Ursinus' Greek Life: a timeline of the complete history of Greek organizations at Ursinus and overview of the past conflicts about pledging between administration and Greek life. Gender Segregation and Inclusion in Greek Life: a discussion on critiques of Greek life's gender segregation and information about the four gender-inclusive Greek organizations in Ursinus' history. Racial Diversity and Inclusion in Greek Life: Ursinus has had Greek organizations on campus for the past 110 years, but the campus only saw organizations focused on racial diversity and inclusion starting 25 years ago. This section will focus on why these racially diverse organizations were present and how Ursinus responded to this.